The SS 300 is the monster of its time, and still continues to awe today. It was the only gun of the classic line-up to achieve 50 feet as advertised--a massive feat even today. 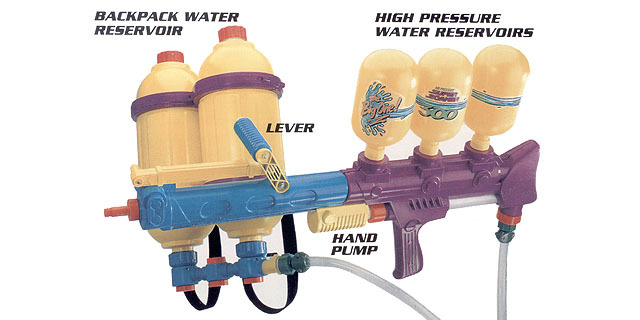 The SS 300 was the first backpack soaker. Its pump volume is massive, and is needed to power its three huge chambers. The gun has a major flaw: it is very fragile. However, it performs at the higher end, only surpassed in range by homemades and the CPS 2000 make 1. The SS 300 is prone to broken firing handles. In case the firing handle breaks or ceases to function, consult our repair guide.